Dr. Ben Bond-Lamberty of Pacific Northwest National Laboratory accepted an invitation to join the Scientific Steering Group of the International Soil Carbon Network. The network coordinates independent soil carbon research in the United States and around the world, and maintains a database through which members can download or share soil carbon data. According to the network website, the Scientific Steering Group's purpose "is to define the major scientific questions and goals of the network, coordinate the sharing of scientific and logistical infrastructure, and decide upon the adoption of common scientific protocols." Bond-Lamberty is one of 21 members in the international group. Bond-Lamberty works in College Park, Maryland, at the Joint Global Change Research Institute, a collaboration between PNNL and the University of Maryland. His research focuses on carbon and nutrient cycling in terrestrial ecosystems. 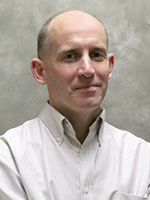 Bond-Lamberty serves on the Environmental Research Letters Reviews Editorial Board and Plant and Soil editorial board. He is also a section editor of the journal Public Library of Science (PLOS) ONE.